Throughout the remainder of the fall and right on into the beginning of a probable harsh winter, there is always time to re-evaluate your closet and think about what timeless pieces you can sport to holiday parties. That time is now, ladies and gentlemen. It is important to consider what kind of event you are invited to, and ask yourself whether or not it’s formal attire. Remember to stop and think first, and do your research. This time of year can be quite magical, so be sure to have the best time, inside and out. 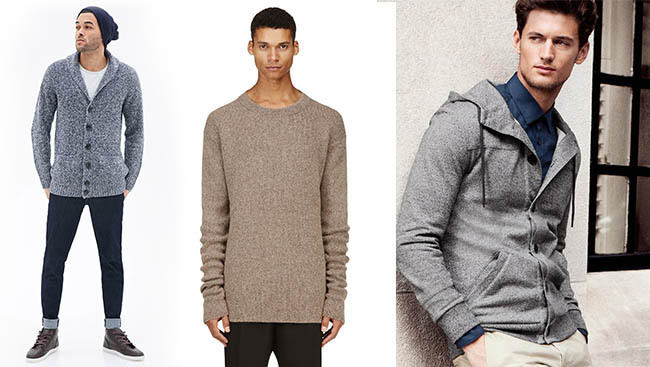 Men, it is all about sweaters this season. Long, oversized sweaters. The dominant colours you should be aware of are gray and deep purples. Forever 21 Men has a wonderful Shawl Collar Marled Cardigan; it’s light gray and goes beyond one’s knees. This kind of oversized cardigan is great when paired with a J.CREW button down in a solid colour, and a dark denim jean. No jewellery is necessary, seeing that your outfit is well thought out. Brown or black dress shoes will suffice just fine on your cold feet. If you are interested in staying warm whilst traveling to and from your events, check out beautifully crafted overcoats by designer Rad Hourani. He has been on the scene since 2007, and works predominately with men’s clothing. You will be the talk of your party when entering the room in a custom-esque Hourani. If you are interested in taking party fashions to another level, consider a funky gray suit by Phillippe Dubuc. His suits tend to be more tailored than others currently on the market, so be sure to take your measurements first. It is suggested to sport a solid button down underneath, and solid tie. If you are feeling rambunctious, wear a black screen printed t-shirt with lettering on it. Even in the colder months, wearing dress shoes without socks is acceptable. 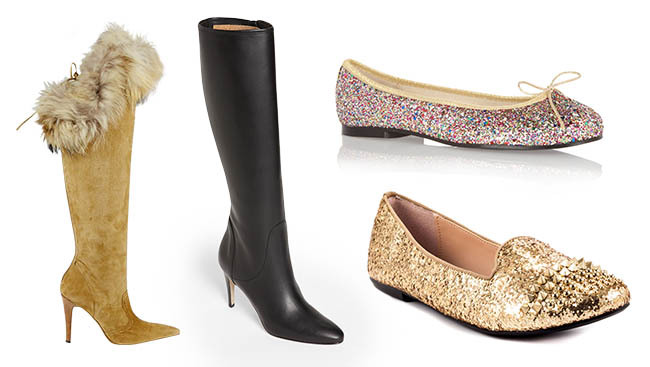 Now ladies, what do you imagine yourself wearing to a wintry soiree? An oversized sweater, too, perhaps? Eileen Fisher offers a crème wool top that can be paired nicely with brown slacks and darker high heels. Be sure to wear a pair of flesh coloured pantyhose with this number. If you are seeking out a fun dress look, try a dress by Mercy. Mercy’s flirty floral peasant-like dress is perfect for a small get together. Wear your Mercy dress with a black Ziliotto jacket. The shoes of choice should be sparkling flats. And if you are feeling ambitious, try a Manolo Blahnik boot. This season, they are the centerpiece to any outfit you pull from the closet. The fur tops and elegant bottoms make the perfect pair for a long night of dancing the night away. Pair this with a black slack and eggshell blouse. Leave the shirt untucked, obviously. Top the outfit out with a chunky necklace. Necklaces this season will be animalistic and really go to the roots of human evolution. Ralph Lauren offers shell, wood, and bone necklaces at reasonable prices for any budget. 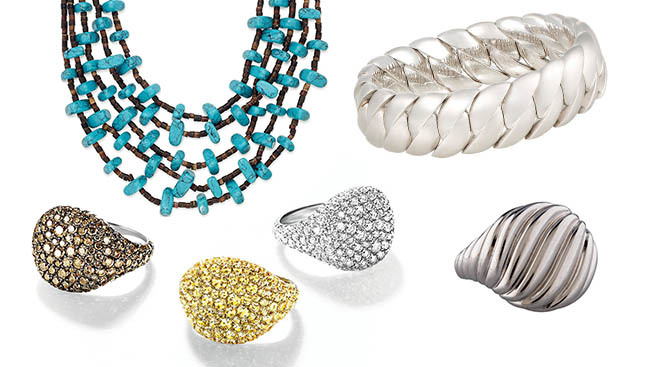 Other jewellery you can easily mix and match with your party outfits are encrusted Pave Pinky rings by David Yurman and Wave Link bracelets by Sidney Garber. Both look fine, trust us. Other topcoat options include animal print patterns; they are designed to keep you looking stylish and keep you warm. Ralph Lauren has a skunk-styled coat that works with any outfit; it is not too warm, either. How about a lighter zebra print jacket by Celine? Other brands to keep a keen eye out for are Ca Va de Soi, Mirabelli, and Mackage. All truly fine choices in our party planning book. One more point we’d like to make, and that is about hair. Hair for men should be a little shaggy and unkept. For woman, shorter hair is also in. Somewhere between a pixie look and a bob. Remember again to plan, plan and plan. Do your research as to what kind of soiree you will be heading to. It is also a smart idea to ask around, and see what your friends are wearing. Ring in holidays in style, and be sure to check up on your latest fashions next time, only inDarpan magazine. Leaves will be falling, wind will be blowing. But what will you be wearing? 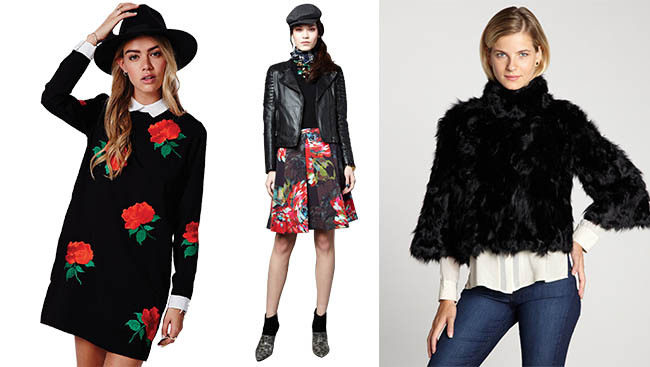 This fall, trends are moving back toward the elegant.